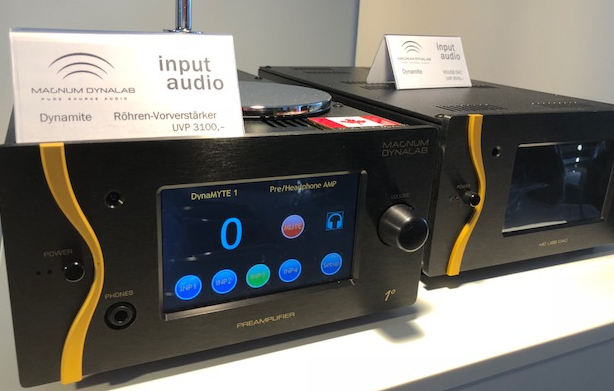 The Dynamyte series was developed so Magnum Dynalab could expand its traditional product base of Analogue tuners, receivers and integrated amplifiers into leading edge new product offerings including pre-amplifiers, Digital audio convertors, multi media music streamers, power amplifiers, phono stages and new digital broadcast tuners. We wanted to offer great sounding products, many featuring our TRACC triode tube audio stages, in a miniature form factor that was cost effective for our customers. We had heard over the years how our customer were running out of room to put more equipment and since we ship worldwide many consumers don’t have the same space in their homes that we do in North America. The Dynamyte product also has to be very feature relevant to be viable and attract a younger or more tech savvy consumer. So this means that every product has its own LCD touch screen and that many of the units can be controlled from your smart phone or tablet. As well they will feature dual zone Wi-Fi and Bluetooth for connectivity for control and playback of compatible sources. So Dynamyte won’t just give you one streaming service on our Music Engine and Music Audio Streamer but virtually every leading service so you get Tidal, Roon, Spotify, Deezer, Qobuz and MQA for master quality playback. Also you get the world’s leading internet tuning server V-Tuner built in so you get over 10,000 internet radio stations and podcasts. The Dynamyte also has to be adaptable for our customer not just with the finish options but with features. So if you like our MDT-1PE preamplifier but also want an FM or DAB digital tuner added on we can do this for a marginal upgrade fee. This lets you customize the unit at a fraction of the cost to add the individual components. Take our new Hybrid tube amplifier the MDT-1 AMP power amp. You can buy this as a straight power amp in stereo or mono, you can order it with the pre-amp as an integrated amplifier, you can add the digital tuner and make it a receiver and then you can also add the DAC. So we hope you can see the promise that the Dynamyte series offers. The Dynamyte series is designed by our audio engineer, Zdenko Zivkovic, and is built in our Brampton, Ontario, Canada factory so you can depend on the sound quality that Magnum Dynalab is famous for. The Dynamyte pre-amplifier is a full featured preamplifier/headphone amplifier that takes up half of our standard component foot print. The input is controlled by our TFT LCD touch screen or your smart phone or tablet. The gold plated TRACC triode output audio board supplies the gain. The TRACC audio board has been found in our top of the line tuners for many years and now this newest revision provides the life like quality of the audio. Expand your pre-amp with a digital FM/DAB tuner or add our ESS Sabre DAC as an option. Our Music Engine provides the latest in streaming services, internet radio stations, multi-zone control and MQA playback. It is designed for the serious audiophile that already has a good quality DAC in their system as it only offers digital output. The streaming services and the internet stations are controlled and operated from your IOS or Android smart platform by phone or tablet. It supports virtually every HD playback format and storage device. 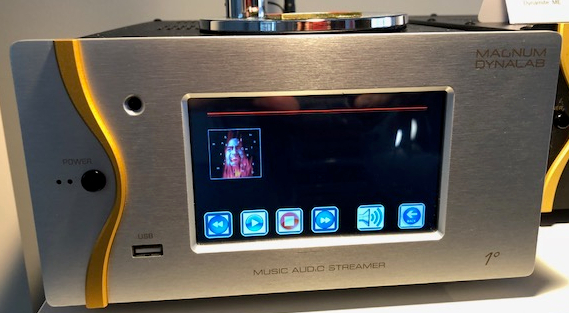 The Music streamer is our all in one streaming and media solution. In addition to the same features as the Music Engine it includes our TRACC triode tube audio section for analogue playback and our HD-USB to 24/192 Asynchronous ESS Sabre DAC with sampling to 384 and DSD. HD Radio, FM tuner with DAB including slideshow. This is a powerful DAC in a small package with our TRACC Triode tube audio stage. The ESS Sabre DAC does the processing and the sampling rates are displayed on screen. The triode tube audio stage adds the life like musicality to the DAC. The tube sound with a digital source is made to work together. Control you inputs from the LCD touch screen. The integrated amp features the same amplifier section as the MDT-1 Power amp with the addition of the pre-amp. Get everything you need in this compact integrated package including tuner and DAC as an option. The power amp has evolved from our main line of integrated amplifiers and features the revised TRACC Triode tube audio gain stage. It is rated at 100 watts per channel at 8 ohms. The tubes in the front end give you the gain and the lifelike musicality and are melded with our transistor Sanken outputs which give the design stability and reliability. Order this in stereo or as a mono-block.